The CHATILLON BP15 Series bench platform scale features a large, easy-to-read 15-inch (380 mm) dial with knife-edge pointer for accurate measurements. BP13 Series bench platform scale features a large, easy-to-read 13-inch (330 mm) dial. Scales are supplied for H44 Class lll "Legal for Trade" applications. The CHATILLON® BP15 Series bench platform scale features a large, easy-to-read 15-inch (380 mm) dial with knife-edge pointer for accurate measurements. Scales are supplied for H44 Class lll "Legal for Trade" applications. Designed for platform use, the BP15 features a rugged cast-iron base with heavy-gauge steel platform for excellent stability. The scale's mounting feet are adjustable. Options include a stainless steel platform, 7-inch (178 mm) deep provisional pan and quick tare knob. Tare adjustments may be made up to 10% of rate capacity. The scale's head cover and column back are removable for easy access to the dial mechanism and the dashpot. Units are shipped assembled. The CHATILLON® BP13 Series bench platform scale features a large, easy-to-read 13-inch (330 mm) dial with knife-edge pointer for accurate measurements. 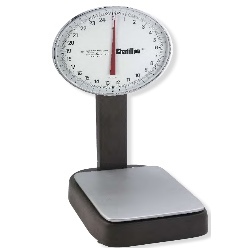 Scales are suitable for H44 Class lll "Legal for Trade" applications. Designed for platform use, the BP13 features a rugged cast-iron base with heavy-gauge steel platform for excellent stability. The scale's mounting feet are adjustable. Options include a stainless steel platform, 7-inch (178 mm) deep provisional pan and quick tare knob. Tare adjustments may be made up to 10% of rated capacity. The scale's head cover and column back are removable for easy access to the dial mechanism and the dashpot. Units are shipped assembled.